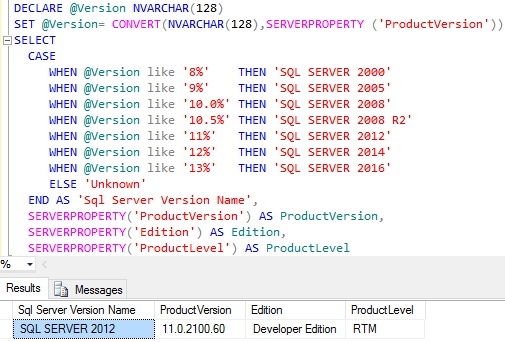 Many times we come across a scenario where we need to know the Sql Server Version Name (i.e. like Sql Server 2005, Sql Server 2012, Sql Server 2014, Sql Server 2016 etc), Version (i.e. like 11.0.2100.60 it is of the format major.minor.build.revision), Edition (i.e. like Express Edition, Developer Edition, Enterprise Edition etc), Product Level (i.e. like RTM, SP, CTP etc) etc. This article explains how we can get all this information. I enjoyed reading this post and please keep posting.